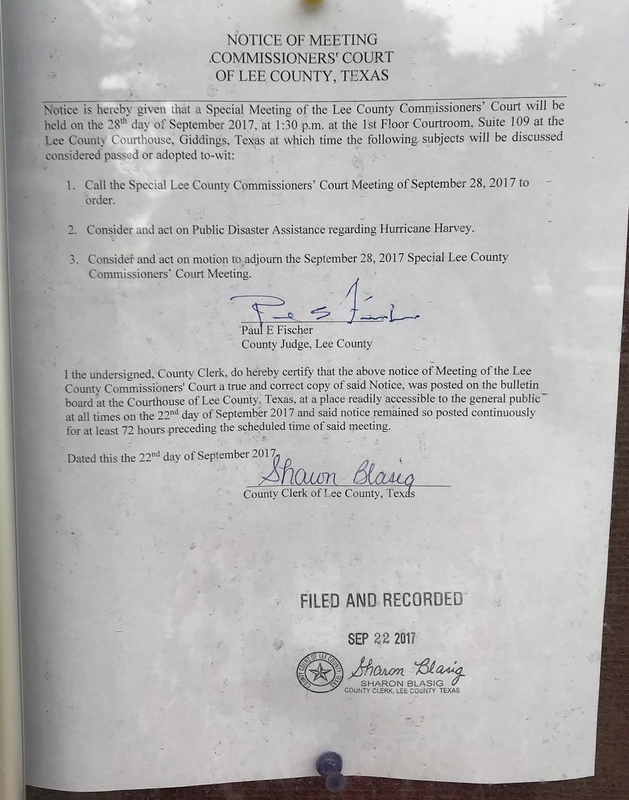 The Lee County Commissioners' Court is held at the Lee County Courthouse, 200 S. Main St. Giddings, Texas 78942, in the Commissioners' Courtroom, 1st floor, Suite 109. Commissioners' Court is held on 2nd and 4th Monday of each month. Click on the date to open the agenda. November 29, 2017 Special Meeting - 1:00 p.m.
December 4, 2017 Special Meeting - 8:00 a.m.
December 18, 2017 Special Meeting - 8:00 a.m.
December 29, 2017 Special Meeting - 1:00 p.m.
January 2, 2018 Special Meeting - 8:00 a.m.
January 12, 2018 Election Committee - 1:30 p.m.
January 16, 2018 Special Meeting - 8:00 a.m.
January 22, 2018 Public Hearing - 9:00 a.m.
January 30, 2018 Special Meeting - 1:00 p.m.
February 5, 2018 Special Meeting - 8:00 a.m.
February 12, 2018 Regular Meeting - 10:00 a.m.
February 26, 2018 Regular Meeting - 10:00 a.m.
February 27, 2018 Special Meeting - 1:00 p.m.
February 28, 2018 Workshop - 2:00 p.m.
March 5, 2018 Special Meeting - 8:00 a.m.
March 12, 2018 Regular Meeting - 10:00 a.m.
March 19, 2018 Special Meeting - 8:00 a.m.
March 26, 2018 Regular Meeting - 10:00 a.m.
March 28, 2018 Special Meeting - 1:00 p.m.
April 5, 2018 Special Meeting 8:30 a.m.
April 9, 2018 Regular Meeting - 10:00 a.m.
April 16, 2018 Special Meeting - 8:00 a.m.
April 16, 2018 Workshop 8:00 a.m.
April 23, 2018 Regular Meeting - 10:00 a.m.
April 24, 2018 Workshop 10:00 a.m.
April 27, 2018 Special Meeting 1:30 p.m.
May 7, 2018 Special Meeting - 8:00 a.m.
May 14, 2018 Regular Meeting - 10:00 a.m.
May 21, 2018 Special Meeting- 8:30 a.m.
May 29, 2018 Regular Meeting - 10:00 a.m.
May 30, 2018 Special Meeting - 1:30 p.m.
June 4, 2018 Special Meeting - 8:00 a.m.
June 11, 2018 Regular Meeting - 10:00 a.m.
June 18, 2018 Special Meeting - 8:40 a.m.
June 25, 2018 Regular Meeting - 10:00 a.m.
June 28, 2018 Special Meeting - 1:30 p.m.
July 2, 2018 Public Hearing - 8:00 a.m.
July 2, 2018 Special meeting - 8:30 a.m.
July 2, 2018 Budget Workshop - 9:00 a.m.
July 9, 2018 Regular Meeting - 10:00 a.m.
July 16, 2018 Special Meeting - 8:00 a.m.
July 23, 2018 Regular Meeting - 10:00 a.m.
July 30, 2018 Special Meeting - 1:30 p.m.
August 3, 2018 Special Meeting - 8:00 a.m.
August 6, 2018 Special Meeting - 8:00 a.m.
August 6, 2018 Budget Workshop - 8:30 a.m.
August 6, 2018 Workshop - 10:00 a.m.
August 13, 2018 Regular Meeting - 10:00 a.m.
August 20, 2018 Special Meeting - 8:00 a.m.
August 21, 2018 Election Committee - 9:00 a.m.
August 27, 2018 Regular Meeting - 10:00 a.m.
August 29, 2018 Special meeting - 8:00 a.m.
September 4, 2018 Special Meeting - 8:00 a.m.
September 5, 2018 Public Hearing - 6:00 p.m.
September 10, 2018 Public Hearing - 9:20 a.m.
September 10, 2018 Public Hearing - Budget - 9:30 a.m.
September 10, 2018 Regular Meeting - 10:00 a.m.
September 17, 2018 Special Meeting - 8:00 a.m.
September 24, 2018 Regular Meeting - 10:00 a.m.
October 1, 2018 Special Meeting - 8:15 a.m.
October 30, 2018 Special Meeting - 1:30 p.m.
October 30, 2018 TxDOT Workshop - 2:00 p.m.
November 5, 2018 Special Meeting - 8:00 a.m.